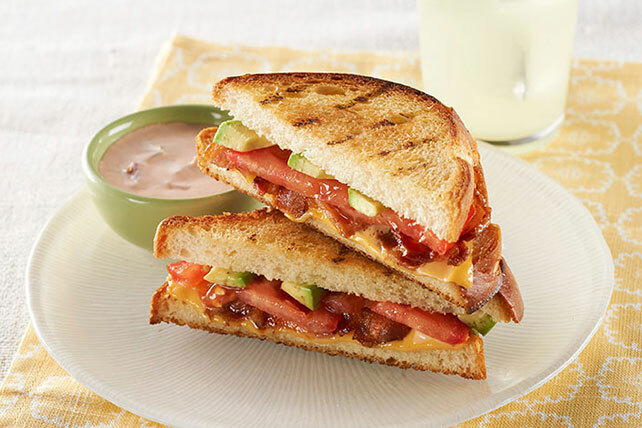 Bring on the bacon with our delicious Avocado-Bacon Grilled Cheese! Add a little zing to your lunchtime bacon grilled cheese sandwich with chunky salsa. Heat greased grill to medium-low heat. Fill bread slices with Singles, bacon, tomatoes and avocados to make 2 sandwiches. Spread outsides of sandwiches with margarine. Grill 2 to 3 min. on each side or until Singles are melted and sandwiches are grill marked. Meanwhile, mix dressing and salsa. Serve sandwiches with dressing mixture. Serve with a cold glass of milk and a mixed green salad tossed with your favorite KRAFT Lite Dressing, such as CATALINA. Prepare using KRAFT 2% Milk Singles and MIRACLE WHIP Light Dressing. Texas toast sandwich bread is a thick-cut bread.